In each of the last two years, my answer has been Tyler Eifert. But don’t take my word for how good the tight end looks at practice. Just listen to former Bengals wide receiver T.J. Houshmandzadeh. The 2007 Pro Bowler served as a coaching intern during the Bengals’ June minicamp and wore a GoPro camera on his chest during a workout for Bengals.com. Houshmandzadeh could be heard gushing about Eifert as he watched him run pass patterns. On Thursday, I asked Eifert if he had seen the Houshmandzadeh video. Of all of the injured players that the Bengals look forward to having back this season, Eifert could have the biggest impact. Consider that the former first round draft pick was only on the field for eight snaps before suffering an elbow injury in the season opener last year and had 3 catches for 37 yards. 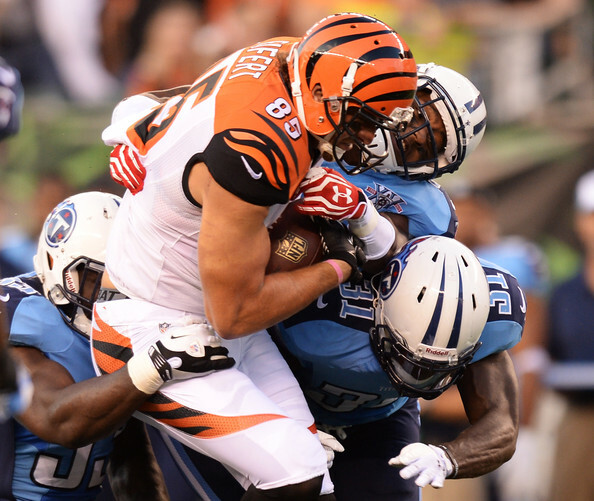 “It was a lot of fun – I remember that,” said Eifert. “The most catches I ever had in a game was five my rookie year, so I was like, ‘This could be a lot of fun this year.’ Then I didn’t make it through the first quarter. Hopefully I can change that this year. Those eight snaps in Baltimore provided a glimpse of the wide variety of ways that offensive coordinator Hue Jackson can use the 6’6”, 250 pound tight end. Eifert lined up as a traditional tight end four times, a slot receiver three times, and an H-back once. The Bengals averaged 7.5 yards per play with Eifert on the field and he caught all three passes that were thrown to him. Additionally, Andy Dalton was 8-for-10 for 78 yards before Eifert’s injury. In addition to dislocating his elbow at Baltimore, Eifert tore labrum in his shoulder during OTAs before last season. Both injuries eventually required surgery, but the former Notre Dame standout says they are no longer an issue. “I feel good,” he said. “I feel healthy, strong, in-shape, and ready to go. Although Eifert is only in his third NFL season, he is the Bengals only tight end with regular season experience (not including H-back Ryan Hewitt) following the departure of free agent Jermaine Gresham. “It is a little bit weird when you put it that way, but I’m confident in what I can do on the field and being a leader in this locker room,” said Eifert. If you make it to one of the Bengals 14 open-to-the-public practices during training camp, I suspect that Eifert will stand out as one of the most impressive players. And if he stays healthy, the 24-year-old could be poised for a breakout season.